A week ago, the Cleveland Cavaliers made NBA trade deadline history in a roughly two-hour window. Cleveland acquired four new players and a second round draft pick, and subsequently sent away six players, a first round draft pick for this year and a second round pick for 2020. Not only was this an unprecedented sequence of moves, but it was done by an organization that has made the NBA finals the last three years, and won the 2016 title. One would think a complete overhaul like this isn’t necessary for that reason, but the Cavaliers have been a mess lately. They currently third in the eastern conference and an uncomfortable four games up on the east’s eighth seed. This type of rough stretch isn’t anything new for superstar small forward LeBron James and his Cavaliers or Miami Heat teams of the past, where he played from 2010-2014. James’ teams have regularly struggled in the month of January. But given that James has appeared in the NBA finals seven consecutive times, NBA fans have grown accustomed to ignoring signs of the Cavs “imploding” at this point in the season. Having said that, the series of moves made by the Cavs indicates that the problems within this organization this season are far more severe than years past. There have been multiple instances of players showing serious friction between one another, such as Cavs star forward Kevin Love and former Cavs guard Isaiah Thomas getting into a heated verbal exchange during a players only meeting. In addition Cavs owner Dan Gilbert, and franchise player James have an ongoing rocky relationship that dates back to Gilbert releasing a public statement where he questioned James character and called him a “coward” for bolting from Cleveland for Miami back in 2010. The fear of James leaving Cleveland has entered Cavs fans minds once again, as his contract expires again this summer, and there is a heavy possibility that James tests the waters as a free agent. The Los Angeles Lakers, Houston Rockets and San Antonio Spurs are the leading candidates as of now. The clock is ticking on the Cavs front office to appease James, and hopefully this complete overhaul did enough to keep James put in Cleveland for the remainder of his career. One of the biggest issues with the Cavs roster prior to last week’s trade deadline was they had eight players in a contract year. Meaning, those eight guys are all especially trying to impress the front office, as they’re playing for a new deal this offseason. With that in mind, those players are inclined to play with a selfish mindset. Luckily for the Cavs, last week they got rid of three of those eight players with expiring contracts. Not only did they dump those contracts, they dumped Isaiah Thomas, Dwyane Wade, and Derrick Rose, three ball-centric guards who all have a history of injury and aren’t at the pinnacle of their careers. With this new look roster, James will regain full control of the offense once again, and will have less responsibility to make sure those guys get their touches. In terms of what Cleveland received, one glaring upside is how youthful the pool of players is. Jordan Clarkson and Larry Nance Jr., both acquired from the Lakers, as well as Rodney Hood from the Utah Jazz are all 25 years of age. Lastly, George Hill, who was acquired from the Sacramento Kings, is a solid veteran with playoff experience at age 31. He’s not a world-beater by any stretch, but he’s someone who understands how to control and operate a offense the way a traditional point guard is supposed to. He also is currently third in the NBA in three point percentage for the season, which is huge for someone playing alongside James, who loves to drive and kick it out to his teammates on the perimeter for three balls. The other franchise that benefited from Cleveland unloading their roster is the Los Angeles Lakers, who are the biggest winner of the deadline. Although Clarkson is a solid offensive weapon hovering around 14 points per game for his career, he’s undoubtedly overpaid, receiving $50 million over the next four years. Ridding themselves of Clarkson’s and Nance’s contract, opens the door for NBA legend and President of Basketball Operations for Los Angeles, Magic Johnson and the Lakers front office to sign major free agents this offseason. As aforementioned, the Lakers will attempt to lure James and Oklahoma City star Paul George, which hypothetically would revitalize the Lakers, making them an immediate threat to win NBA titles moving forward. All of the notable players moved at the deadline had impressive debuts for their respective squads. Saturday night, in his first game in the purple and gold, Isaiah Thomas dropped 22 points in 31 minutes off the bench in a 130-123 loss to the Dallas Mavericks. Thomas will have the opportunity to get his feet wet and start for Los Angeles in the short term given that their rookie starter at point guard Lonzo Ball has been out with a knee injury. The chip on the shoulder of Thomas continues to grow, as he’s been traded now twice since finishing fifth in MVP race in an incredible 2016-2017 campaign with Boston. It is still a contract year for Thomas, the Lakers have made it clear that Ball is their franchise point guard, and with the desire to go out and get major free agents, they will not want to give Thomas a new deal this summer. So even though this may be a beneficial change and opportunity for Thomas short term, expect the lakers to let him walk in free agency and Thomas will be on the move again come this summer. 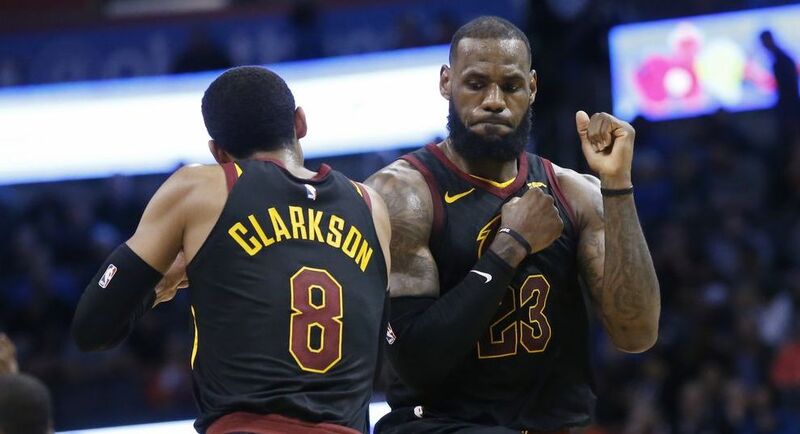 As far as Cleveland, the newcomers got a chance to make a couple statements debuting for the Cavs on national TV in showdowns at the Boston Celtics last Sunday afternoon, and at the Oklahoma City Thunder Tuesday night. The four new additions for Cleveland combined for 97 points over the course of the two victories. The Cavs look completely revitalized with their new look roster, playing with an incredible amount of pace and energy. The top two scorers acquired in the Cavs trades have shined on that end of the floor. Clarkson finished with 17 against Boston, and 14 versus Oklahoma City. Hood contributed 15 and 14 of his own in the two games. Meanwhile Hill is stealing the show on the defensive end, particularly in the Celtics game, as he had a huge part in shutting down their offense in a dominant second half. Did these moves by the Cavs change how the NBA playoffs would’ve panned out? Probably not. Regardless of what roster the Cavs put out there, they were going to outlast Boston in the conference finals, but still not have enough to compete with defending champions and title favorites Golden State in the NBA finals barring serious injury. So in the long haul these moves may not have many short term ramifications. However, the future of James and in turn the Cavaliers franchise hangs in the balance based on the massive change Cleveland underwent at a trade deadline that fans will remember for years to come.